“Pop decorativism is subverted by industrial minimalism.’ What happens when one of the most creative photographers in the fashion industry teams up with one of the most classic and sophisticated haute couture labels? Such a mixture of creativity and elegance has been today unveiled by Prada, which took Steven Meisel’s ability to shoot masterpieces to portray its resort 2016 collection campaign. 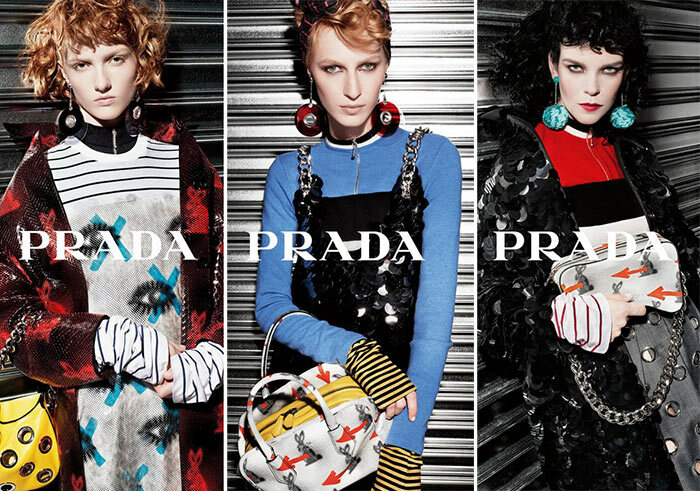 At the same time, thanks to Meisel’s ability to perfectly capture Miuccia’s post-pop art mood, wherein simplicity and modesty go hand in hand, Prada’s 2016 resort campaign absolutely looks like a one-of-a-kind shoot, the ’80s vibes of which have been perfectly mixed with a retro-futuristic allure. Prada’s uniqueness is meant to be seen as a post-modest kind of modesty, as it is clearly made of luxury and almost flamboyant pieces: the collection features a few themes, the most evident of which is the undeniable contrast between its busy and sophisticated fabrics and its almost austere cuts and lines. Such a contrast is also to be seen in Meisel’s setting, as he chose to shot the models against a metal roller shutter, as if they were just outside of an Eighties fancy club. Such a choice makes the campaign look more like a book about a modest club kids’ crew from the ’80s rather than a resort fashion shoot. To portray Prada’s resort 2016 collection he took advantage of his own experience in the late ’80s, a decade, when he used his abilities as a photographer to pave the way for models such as Linda Evangelista and Naomi Campbell. He is famous for making each woman, who has performed for his lens, a star, and for this reason models Lineisy Montero, Lexi Boling, Julia Nobis, Meghan Collison, Ina Maribo Jensen and Greta Varlese have probably been more than happy to be able to model for such a great contemporary artist. Besides asking for Meisel’s help, Miuccia Prada also went the whole hog looking for Pat McGrath’s contribution, namely one of the most influential makeup artists in the whole world (according to Vogue). If you particularly liked the campaign, and also enjoy Meisel’s works, Prada has just released a making-of video on its official Youtube channel, which features a catching track made by San Francisco-based artist Holly Herndon.